It's my feeling that critics are being a little too easy on Adam Green's Frozen. I guess in a way I can see why. After the gleefully gory fun of Hatchet the relative newcomer was proclaimed the great white hope of indie horror and everyone awaited what he'd do next. Chairlift horror? Didn't see that coming! 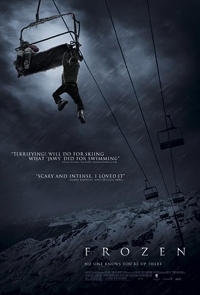 Unfortunately, looking beyond the high concept of three people trapped on a chairlift, Green's script feels like a first draft and the plotting is repetitive and kind of sloppy when it should be unpredictable and nail bitingly suspenseful. Wolves? Again? Really? This isn't to say Frozen is a "bad" horror film. It's more like an average indie thriller with a good concept, or a noteworthy sidestep into the survival genre. And considering Green could have shot this on camcorder and called it a "found footage film," I think he makes a good case for wanting to be considered a classic filmmaker. But, even though Green shows talent, at the end of the day the story just can't seem to sustain a feature length film and I doubt many people will revisit it once they give it a spin. Things that DO work: The three main actors are all good and work well with what they are given. You really feel like the characters are freezing to death. Two bits of practical gore FX are truly cringe-worthy. The ending is subtlety ambiguous unlike Hatchet. Final thoughts? Not sure how this made it into Sundance. Watch with friends for maximum enjoyment. Oh that's a shame, have to say I've been looking forward to this a lot. I hated this film. I'd give it a 3/10. I agree completely with quietearth, just watched it last night and hated it. Frozen was better than I expected. That said, why didn't they just tie their clothes together to get down? BTW, since you're reviewing EIFF films, I'd love to know what you think of The Academy. It looks amazing. 80's action in a grindhouse setting. Runner up for best special effects at this year's Action on Film Festival. Playing tonight!